The Stanford swing arm table lamp finished in antique brass, with beautifully curved arm and simple clean detailing, surrounded by a beige pleated fabric shade. 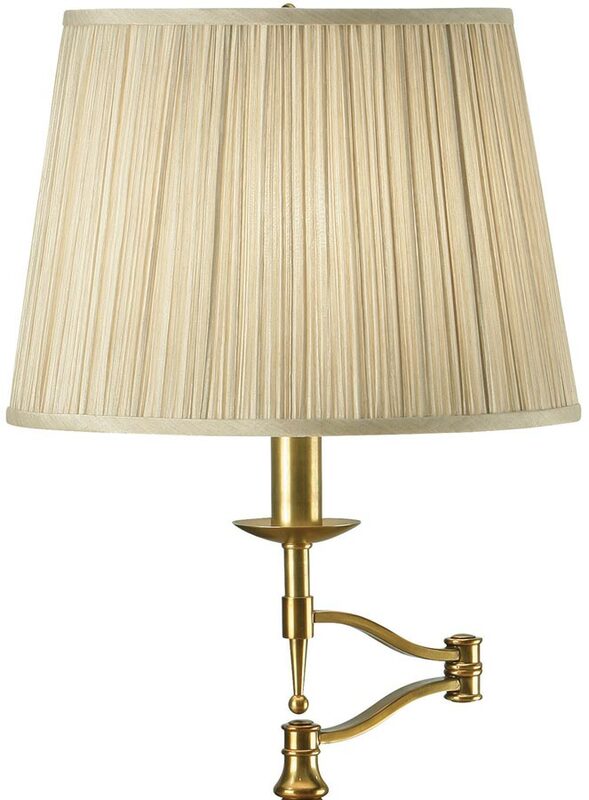 A magnificent, antique brass swing arm table lamp, with circular base, slender stem and elegant hinged section. A curved arm lamp holder features a candle drip, candle tube and lower drop finial, topped with a 14-inch pleated beige faux silk lamp shade. A timeless modern classic perfectly contrasted by the soft antique brass, which co-ordinates perfectly with a variety of traditional or modern interior designs. The perfect addition to a traditional or contemporary living or dining room. Fitted with an inline cable switch for convenience. Part of the magnificent Stanford range from the New Classic Collection designed and manufactured by Interiors 1900, an opulent lighting design finished in antique brass.